Amphetamine uses the standard approach (via Service Management framework) set forth by Apple. I wonder if you can design a circle icon that countdown the remaining session time, just like the installation progress indicator on iOS but a reverse way. Because I want to know how much time it remains but dont want the time itself being shown on menubar. This is a neat idea! Certainly a possibility. It would be great to see amphetamine be able to detect dropbox synching in process and prevent sleeping. I do a lot of dropbox uploading via their desktop app that takes a few hours every couple of days. I need to manually set up a session to block sleeping during the synch. I guess at the length of the upload. Amphetamine works pretty well for this, but it would be nice if it could detect that dropbox is actively synching and trigger a session. Dropbox app is running all the time. Great product but the new version lost "According tiSchedule.."
On MBP high-end models there are two graphics chips, I would be awesome if Amphetamine could trigger this options. Sorry, but I do not plan on considering this. Thanks for the suggestion though. It would be great if in addition to the general timeout/sleep Amphetamine could also control audio volume. I've been meaning to create an app that will keep the volume on while the machine is awake and being used during certain hours, but auto-mute when the machine/monitors sleep after specific times. That way, I can listen to music while doing something else, even with display sleep, but mute overnight when the display sleeps but I'm not using it. This is a neat idea, but I’m not sure it would be best implement in Amphetamine. I’ll review whether this is even possible in a sandboxed app from the App Store, however. 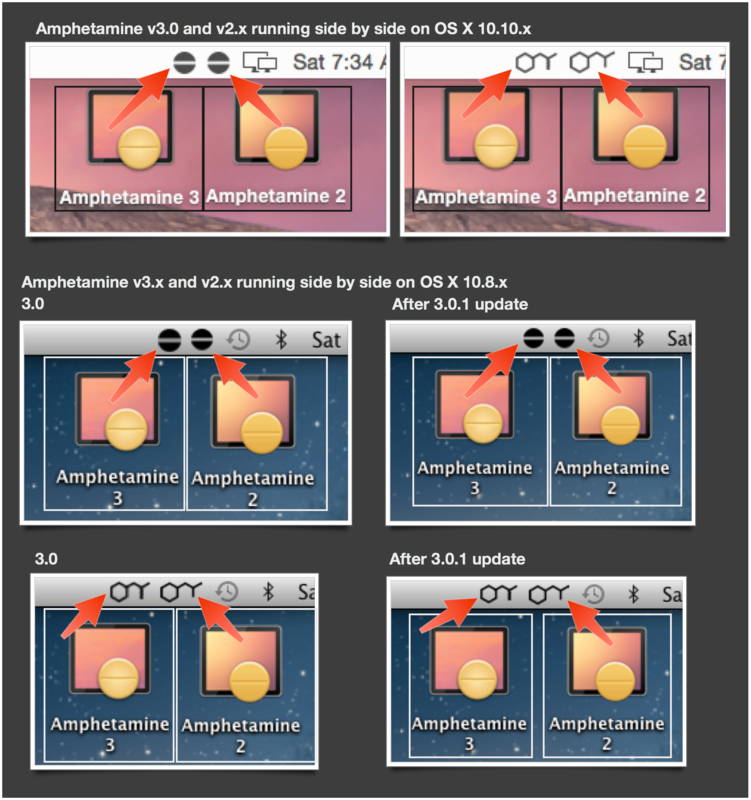 I’m not even sure where this Stay Awake button is… maybe it was in Amphetamine v2.x ? A fun a idea, yes, but likely not something I will implement. Thanks for the suggestion though! In this way, if one wants to reset the timer, one can simply double click on the icon instead of moving the mouse around. This would be cool to see! This might be possible, but only on macOS 10.10 and above, I believe. I’ll look into it. It might be nice to lock screen when I leave my machine and my iPhone is with me. This is an interesting idea, but I am not familiar with development involving Bluetooth devices. I will look into it, but honestly, I don’t believe this is something I would implement. There are stand-alone apps that accomplish this, and I think it would probably be best to use one of those for this feature. I'm not exactly sure why it doesn't appear on the list even after unchecking "Don't show known system & help apps", but it would be a useful addition. For Plex Media Server, the helper process that performs transcoding is called "Plex New Transcoder". Amphetamine can unfortunately only “see” certain other apps and processes. This is a restriction put in place by Apple that I cannot fix. Typically, Amphetamine can only see “user” processes and apps. Ones that require admin privileges to run are often not see. Unfortunately, if the app/process does not show up as selectable in Amphetamine’s list of apps, there is no way for me to force it to show that I know of.